Stories you don't want to see if you're a Member of Congress: this. Image from Fox News Insider (http://insider.foxnews.com/2014/01/29/video-gop-lawmaker-michael-grimm-curses-threatens-reporter-after-state-union). One of the most shocking stories from election night was the fact that not only did a Congressman under indictment win reelection, but he actually won it by the largest margin he’s ever won election by: 12 percent. Staten Island’s Michael Grimm hasn’t gotten a lot positive press this past year. Grimm eventually apologized to the reporter, who accepted his apology. What is the background of this man who received the “Worst Week in Washington” Award in 2014 not once, not twice, but three times? Despite his current notoriety, Grimm had a pretty stellar background before entering politics. Grimm served as a Marine, award-winning FBI Special Agent, US Marshall, Undercover FBI Agent, etc. Before the election, Grimm received a 20 count indictment regarding his co-ownership of a restaurant (before serving his time in Congress). This left local (and national) Republicans in a fix. The indictment had come down after the filing deadline, so they were stuck with Grimm as their candidate no matter what. Their silver lining was that Grimm’s opponent this previous election cycle was one of the worst candidates in the country. Does the ineptitude of Recchia as a candidate explain Grimm’s landslide victory? Not entirely. This district is based mainly on Staten Island, and Recchia hails from Brooklyn, which plays terribly with the majority of the district (again, his “accomplish[ment of] the unprecedented feat of failing to give a single coherent answer when he was interviewed hoping for the Daily News endorsement” and other serious flaws doesn’t help). Now that the election is over, and Grimm has pled guilty, we can move on, right? Although Grimm had said during his reelection campaign that if he is “unable to serve” he will resign, he now seems intent on staying in office as long as possible. Regardless of how this story plays out, things could be a lot grimmer for Congressman Michael Grimm. Although the title suggests that Michael Grimm is Congress’s most interesting member, plenty of arguments could be made for other members. However, given the current news, I think it’s not too much of an exaggeration. Stories you don’t want to see if you’re a Member of Congress: this. 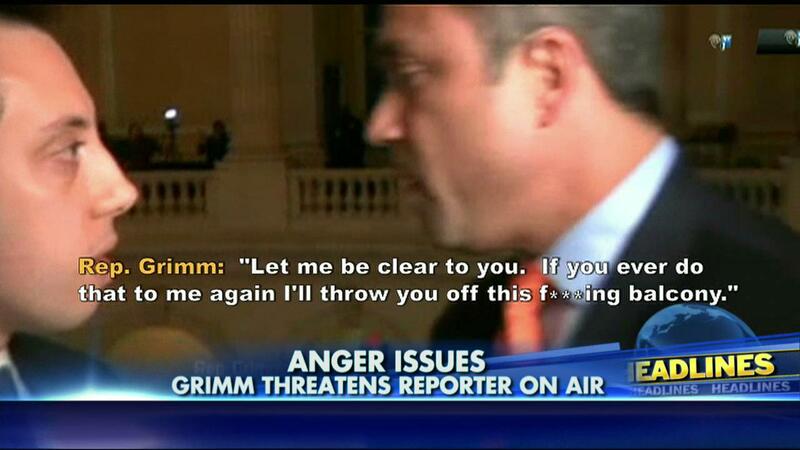 Image from Fox News Insider (http://insider.foxnews.com/2014/01/29/video-gop-lawmaker-michael-grimm-curses-threatens-reporter-after-state-union).